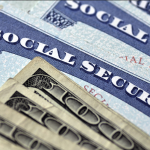 Spending on Social Security recipients will exceed revenues this year for the first time since 1982. Worse, the SS trust fund, which holds $3 trillion, will be empty by 2034, after which recipients will receive 75% of scheduled benefits absent programmatic changes. Medicare’s insurance fund will be depleted in 2026, after which 91% of costs will be covered. 61.5 million persons receive SS, 58.4 million receive Medicare. Save more money!